Sustainable, rope grown mussels on the coast of Maine. We cultivate our mussels responsibly at two locations on the Maine coast, Clapboard Island and Bangs Island, utilizing sustainable aquaculture practices. Our farms are a series of rafts, each with hundreds of specially designed "droppers" that provide a safe habitat for our mussels to grow. Bangs Island Mussels start their lives as wild juvenile mussel seed that we nurture in the protection of our rafts until they are ready to harvest. 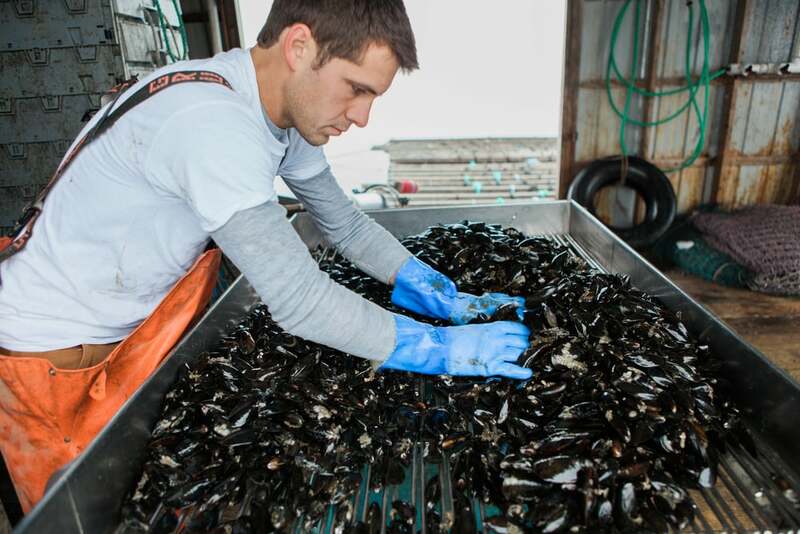 When harvest time comes, we make the most of low impact practices to bring our mussels home to Portland, Maine. The Bangs Island Mussels fleet runs on biodiesel and we maintain the highest environmental standards in every aspect of our business. Aside from their amazing taste, we love mussels because they are good for the ocean. Mussels are highly effective filter feeders that improve the water quality around them simply by living and growing.